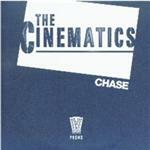 The Cinematics are a Glasgow-based band who released this lovely little single, their debut, through TVT Records on 10th September. Having played T-In-The-Park and supported the likes of Oceansize, The Cinematics are clearly going somewhere in the world of gigs. "Chase" is, like I said, a lovely little single. It's got a nice, jangly indie vibe to it, with some soaring vocals and a catchy chorus that could see this band shift quite a few records in the near future. It is definitely not a bad song. Still, I can't help to feel that the band are playing a bit safe, sticking very rigidly to a radio-friendly format, that could make the song easily overplayed. Still, a nice song, I've listened to it four times in a row now, so The Cinematics have done something right.